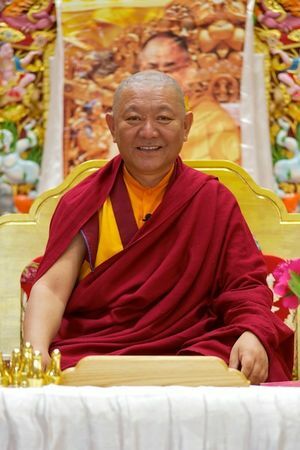 From May 14 to May 16 2010, Ringu Tulku Rinpoche taught in Lerab Ling on An Instruction on the View of the Mahayana Clarifying the Two Truths by Patrul Rinpoche, a short text on the two truths by Patrul Rinpoche. This event marked the re opening of Rigpa's Shedra West after a four-year break to accommodate the first Rigpa Three Year Retreat. The teachings, in which Rinpoche displayed his customary clarity, humour and uncanny knack for conveying difficult points in a practical and accessible way, were attended by more than a hundred students in Lerab Ling, and simultaneously streamed via the internet to centres in Dublin, Barcelona, Madrid, Brisbane, Sydney, Düsseldorf, Munich and Nice. This page was last edited on 3 February 2019, at 03:22.